Why is capitalism the ideal social system? Capitalism is the ideal moral, political, legal, and economic social system based on the principle of individual rights, that leaves the individual free to rationally pursue their self-interest (happiness) in the free market under the rule of law, resulting in a culture of peace, progress, and human flourishing. Ethically, capitalism is the only social system that leaves the individual free to be moral — act by reason in the pursuit of one’s rational self-interest. Politically, capitalism is the system of laissez-faire/freedom that regards the individual as a sovereign, independent being with an inalienable right to their own life (individualism). Legally, capitalism operates under a rule of objective law (as opposed to a rule of man) whose purpose is the protection of individual rights. Economically, when freedom under the rule of law is applied to the sphere of production and trade, its result is the free-market. Culturally, when such freedom is applied to personal relationships, the arts, technology, and the sciences, it leads to human flourishing, peace, and progress. Discover the foundations of capitalism by taking the Capitalism Tour. Intellectually “chew” the ideas brought up in the tour by browsing the Capitalism FAQ. "No politico-economic system in history has ever proved its value so eloquently or has benefited mankind so greatly as capitalism—and none has ever been attacked so savagely, viciously, and blindly. The flood of misinformation, misrepresentation, distortion, and outright falsehood about capitalism is such that the young people of today have no idea (and virtually no way of discovering any idea) of its actual nature." "...By their silence—by their evasion of the clash between capitalism and altruism—it is capitalism's alleged champions who are responsible for the fact that capitalism is being destroyed without a hearing, without a trial, without any public knowledge of its principles, its nature, its history, or its moral meaning. It is being destroyed in the manner of a nightmare lynching—as if a blind, despair-crazed mob were burning a straw man, not knowing that the grotesquely deformed bundle of straw is hiding the living body of the ideal." "The method of capitalism's destruction rests on never letting the world discover what it is that is being destroyed—on never allowing it to be identified within the hearing of the young." "The purpose of this book is to Identify it." 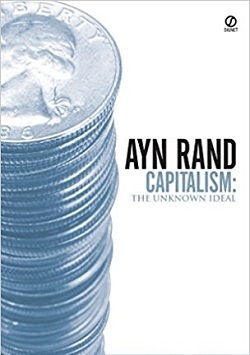 The Capitalism Tour & FAQ was first written in 1996 and is based on Ayn Rand’s revolutionary philosophy Objectivism. Since then, my knowledge and understanding of the nature of capitalism have grown (perhaps not as fast as I would have liked 🙂 ) making it apparent to me that this site was in desperate need of an intellectual and technological update. In 2018, the update of the Capitalism Tour was completed. The Q&A section is presently being updated with a targeted completion date of the middle of 2019. Thank you for your patience! Please feel free to contact me with thoughts, corrections, and suggestions.